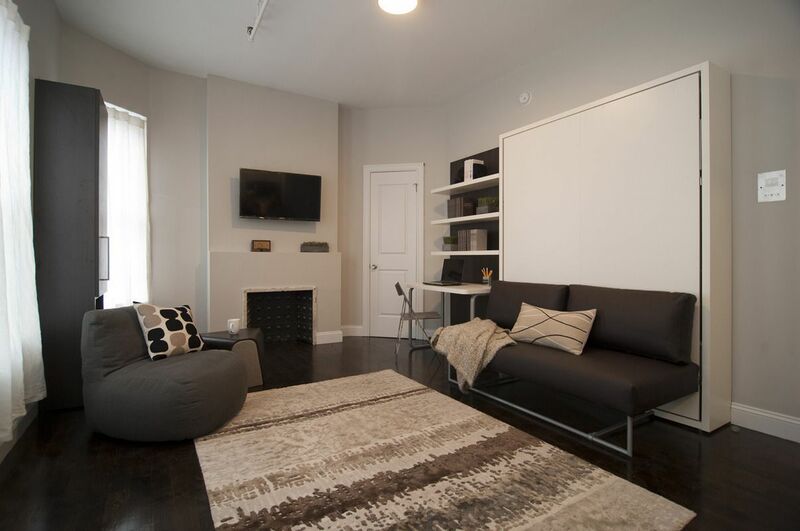 No matter how big or small your home, you want to make the most of the square footage you have. Even the smallest space can be highly functional with the right pieces — big potential in a tiny space. 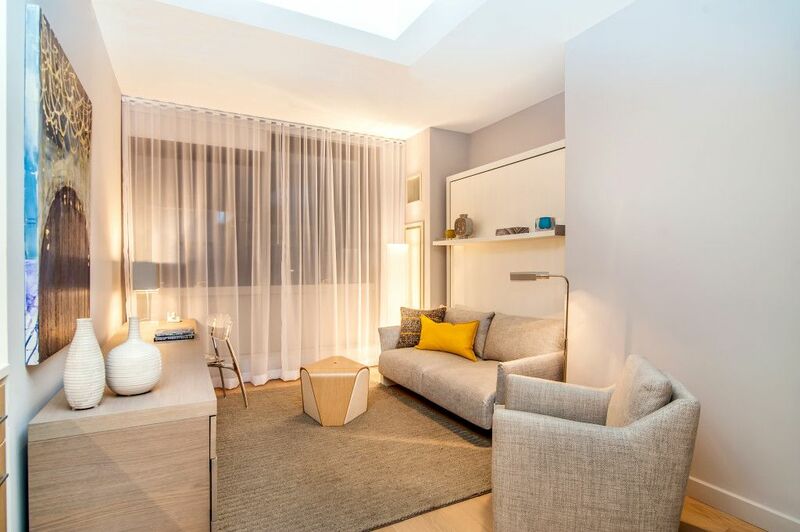 If you don’t have separate rooms, your space can still function as a bedroom, dining area and living space. 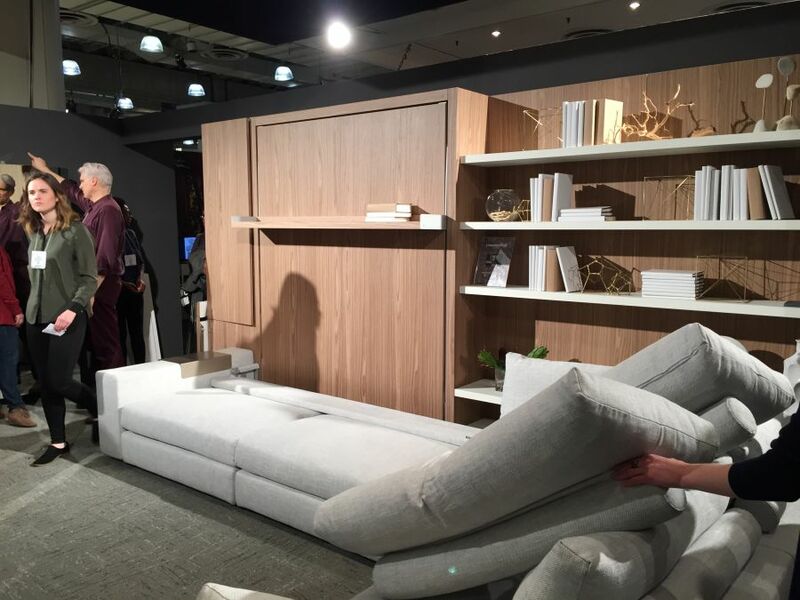 At ICFF 2015, Resource Furniture presented their space saving furniture, namely the wall bed systems they design with the Clei line, which is produced in Italy. 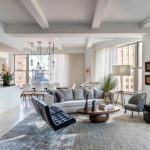 A far cry from the Murphy beds of yore, these designs are functional, stylish, comfortable and unique. Efficiently using all your space is a savings and a benefit. 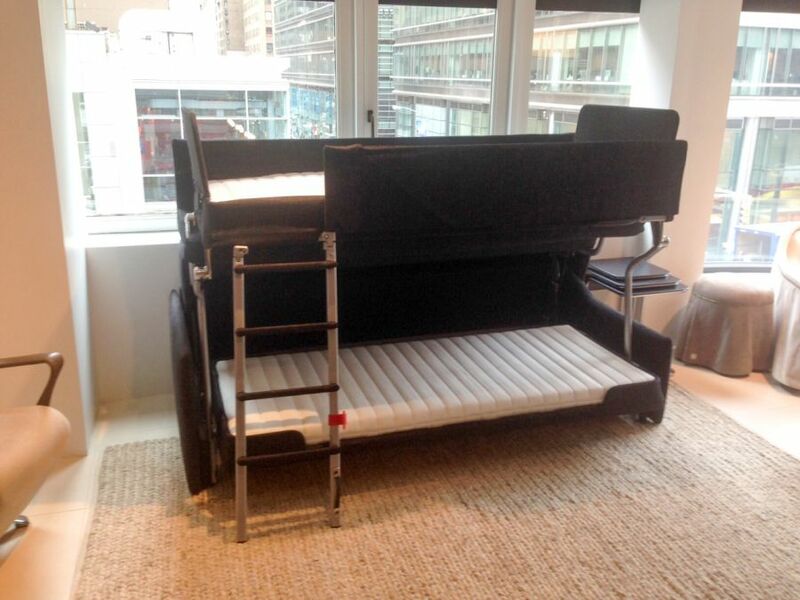 And, no need to take things off the shelf to lower and use the bed — love it! 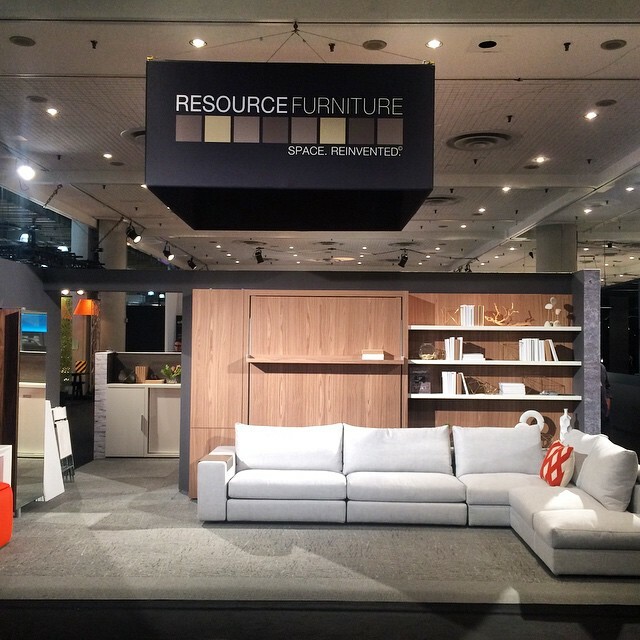 After seeing the models at ICFF, we wanted to know more about Resource Furniture’s relationship with Clei and how homeowners use the multifunctional pieces. 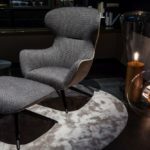 We asked Challie Stillman, Design Director at Resource Furniture, about their products. Stillman is known for her outside-the-box thinking and on-the-spot creativity for clients. You’ve had a long relationship with Clei. How did it come about and what characteristics distinguish Clei products from other space saving systems? 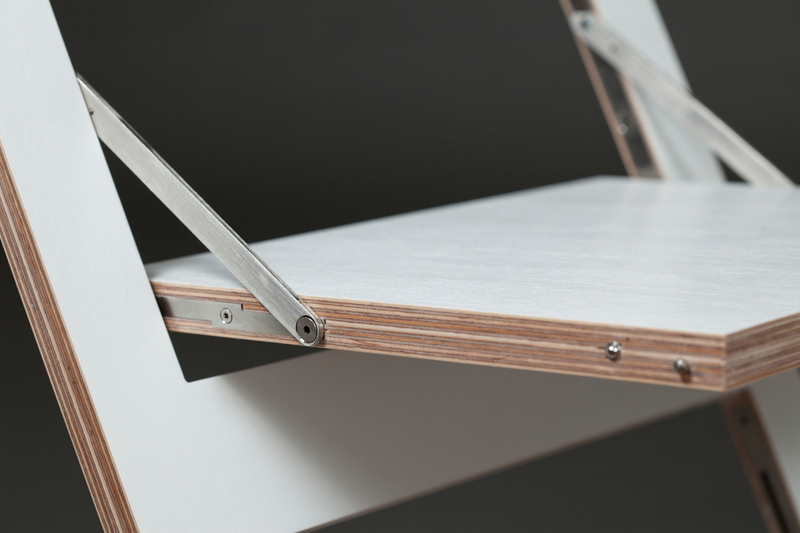 Clei has been designing and manufacturing space saving furniture systems for over 50 years—to say they’ve perfected high quality multifunctional design would be an understatement. 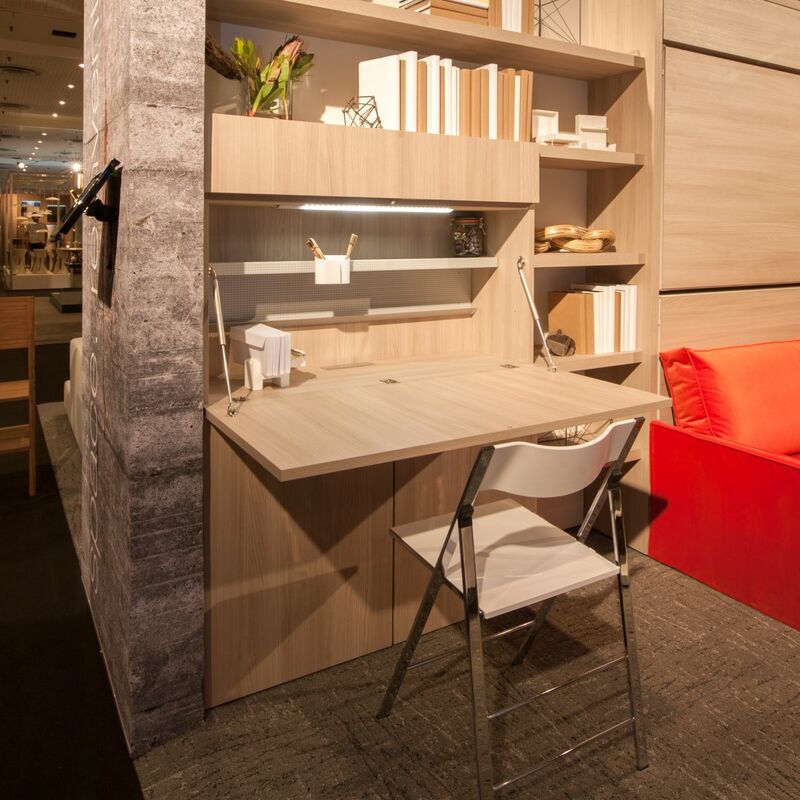 Clei had established themselves in Europe and we recognized a demand in North America for expertly engineered furniture that maximizes space. It was a no-brainer. Urban residents are obviously a target market for these furniture systems. 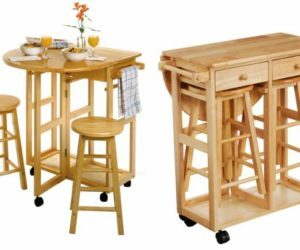 How are suburban customers incorporating space-saving furniture in homes where space is often more plentiful? 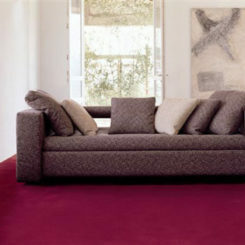 Our furniture is certainly great for urban spaces, but in fact a majority of our clients are outside of New York City. 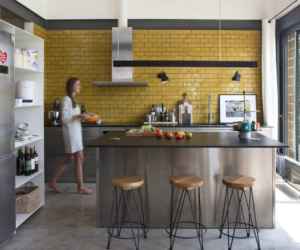 Suburban residents need spaces that do double duty too! For instance, guest rooms go unoccupied most of the time. Multifunctional furniture helps create spaces that can be a TV room or home office and transform into a guest room when visitors arrive! 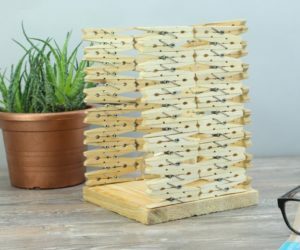 Which pieces are the most popular? Do residents in urban areas favor different products from those in more suburban locations? 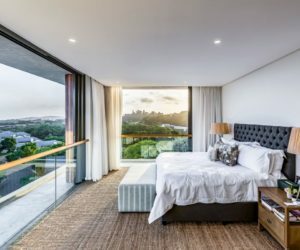 Our sofa wall bed systems are very popular as well as the bunk bed systems, both of which are just as popular in the suburbs as they are in cities. What is the smallest space in which you’ve installed these products? 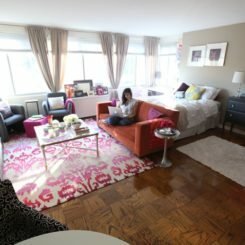 We’ve installed furniture in 155-square foot micro-units in Harlem, tiny homes under 300 square feet, and even a train car. What’s next? Can we expect some new product innovations? Yes! We are always incorporating innovative products and we’re excited to unveil new items later this year… including new systems from Clei! 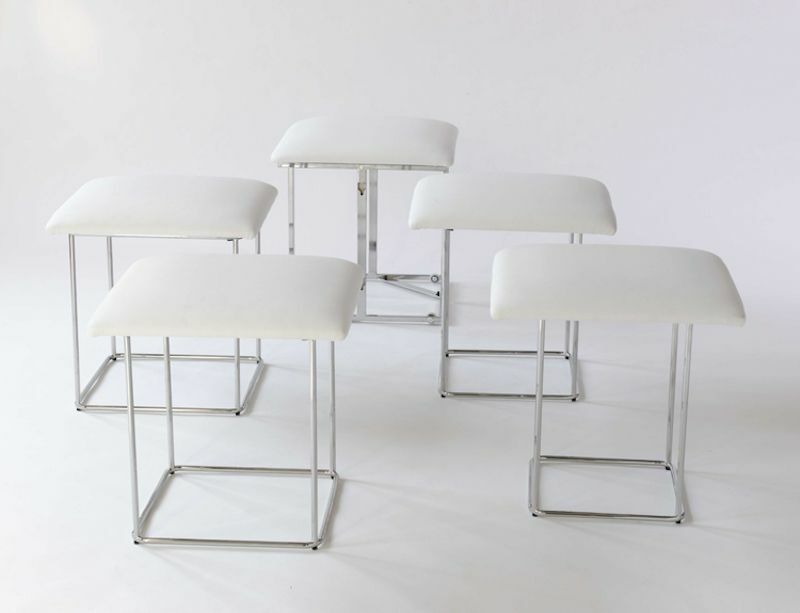 Resource Furniture has a variety of design lines, all customizable for a client’s specific needs. 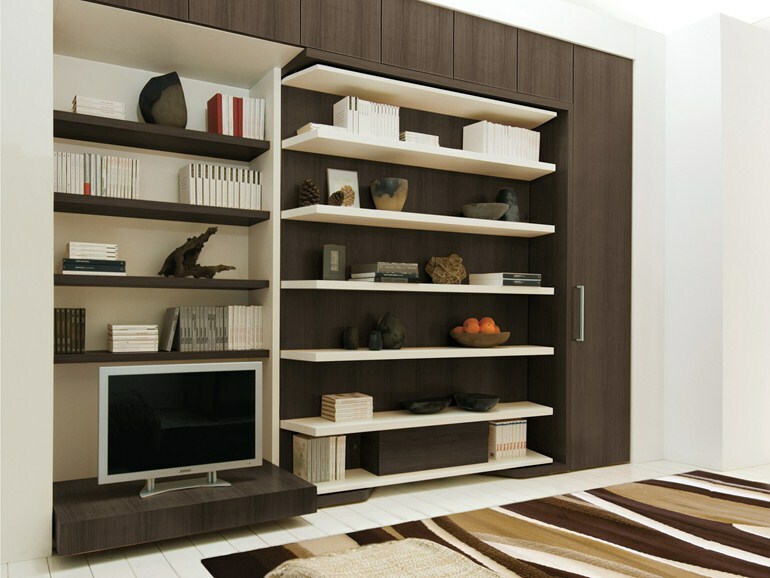 Because each piece is made to order, it will solve any space or storage challenges. Here we take a look at some of their offerings. 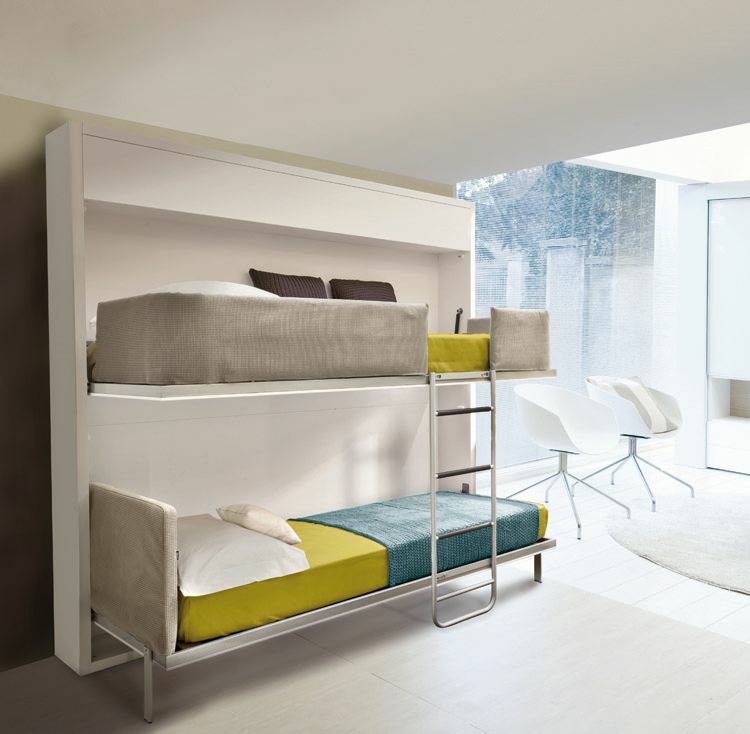 The Nuovoliola 10 is a self-standing, queen size wall bed system. 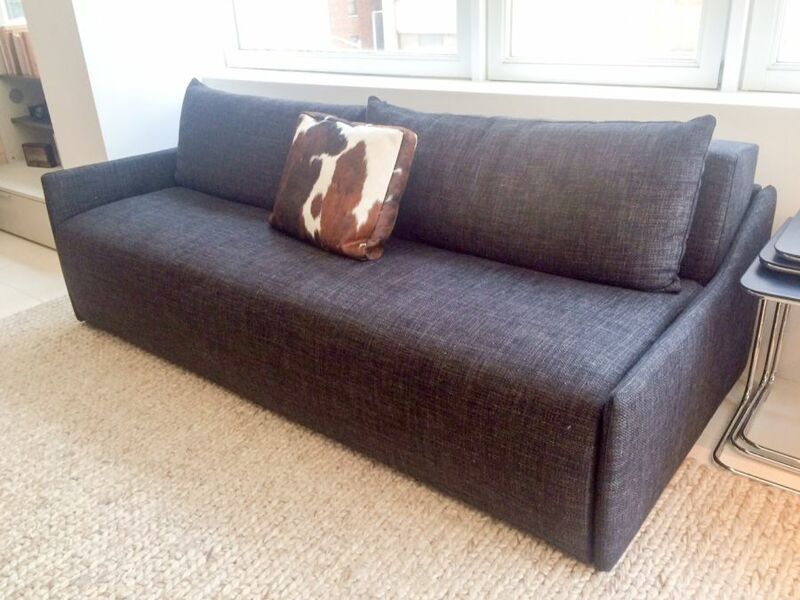 It incorporates a sofa that can seat three people and provides a generous amount of storage under the sofa seat. 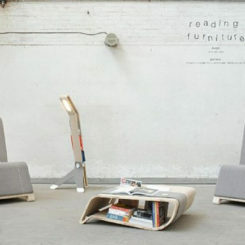 The sofa can be built with or without arms, whichever you desire. 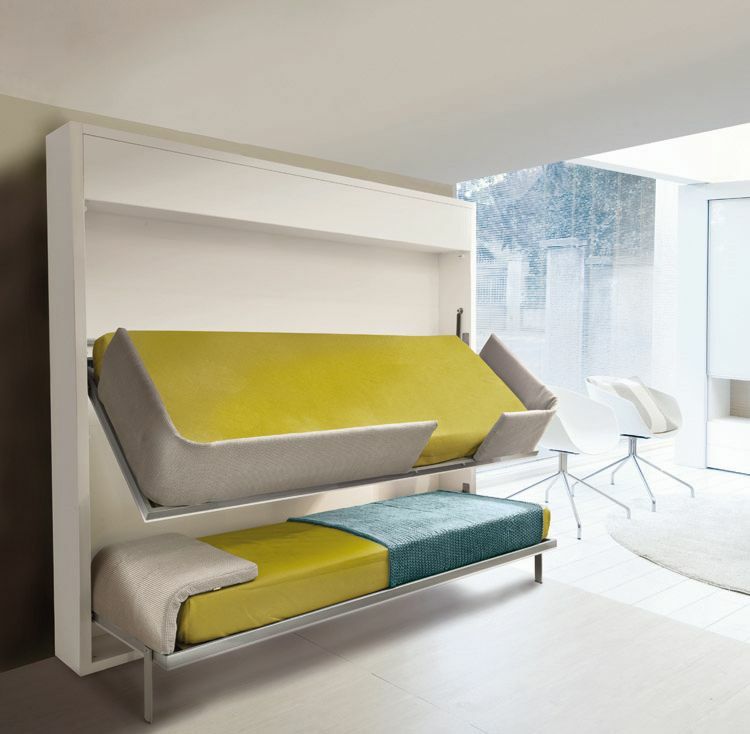 Like other Clei systems, this space saving, modern bed integrates seamlessly with modular Closet and Shelving Systems. 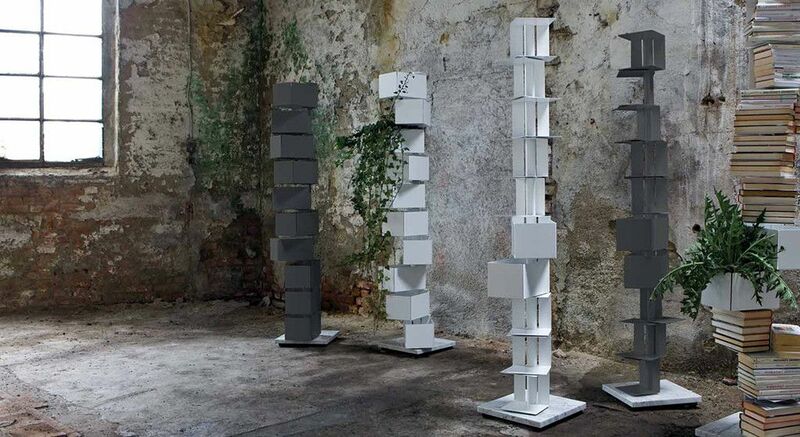 The Atoll 000 is also a self-standing unit. 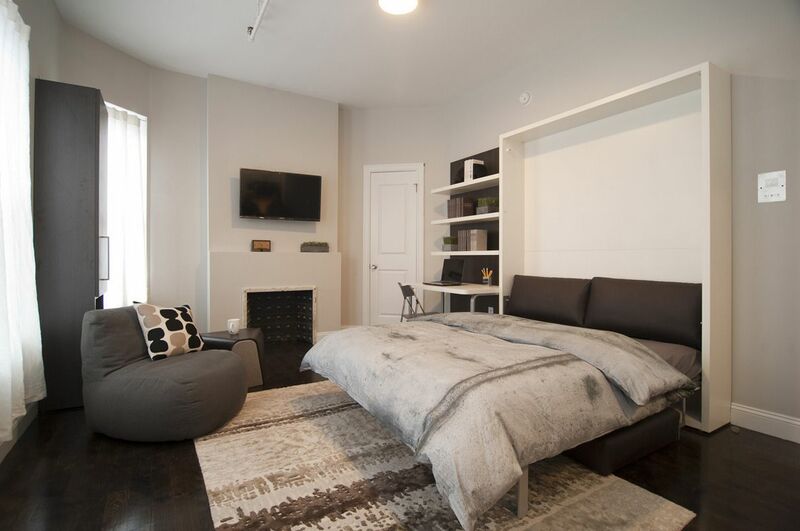 This queen size wall bed incorporates an incredible eight-foot sofa and a stunning amount of storage underneath. 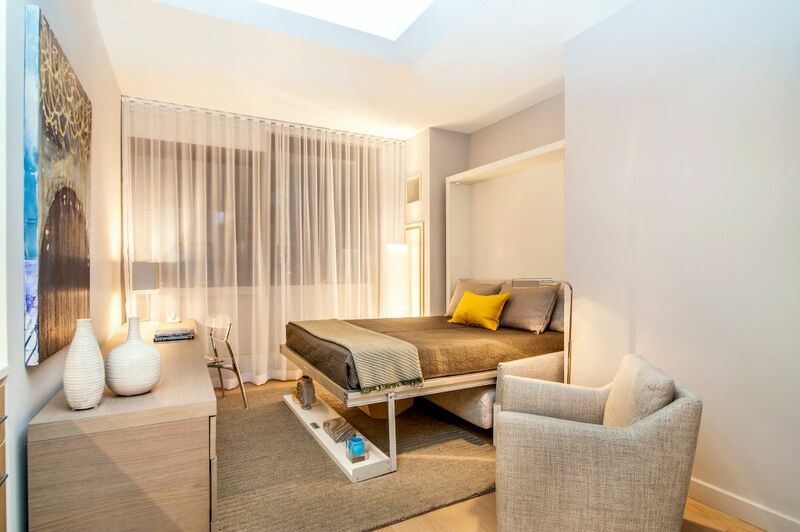 No need to waste space for a guest room when you have a multitasking space like this — use all your space all the time. Above is the Kali Duo Sofa bunk bed system, which is only 12 inches deep when closed! 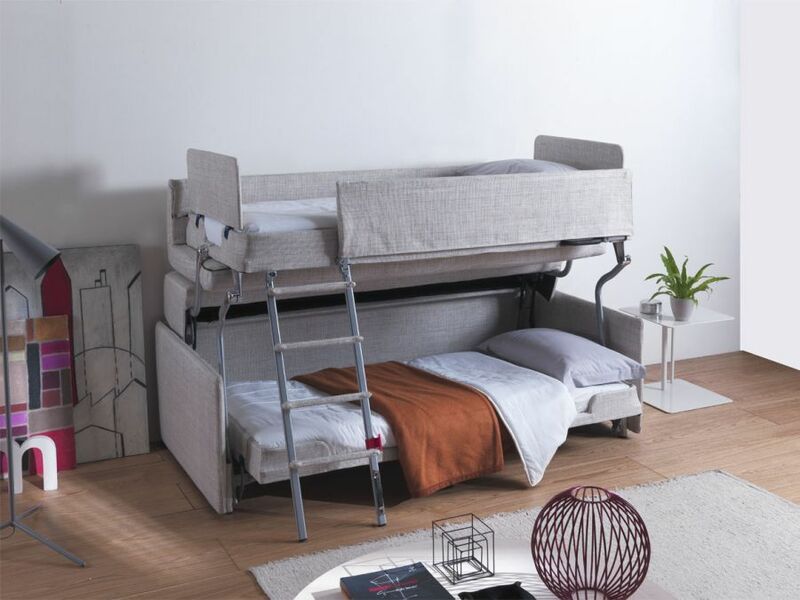 This bunk bed system is popular for guests or for children. The twin size beds have an upper soft barrier and additional storage. 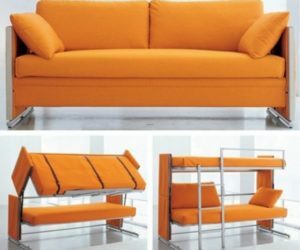 The Kali Duo Sofa gives you the option of using one bed or both. Multiple units can be used in one space to create a bunk room that can sleep many people (and children!) and still be used as a guest living space. 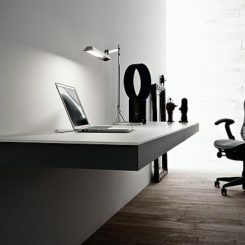 If you don’t have the luxury of having a separate room for a home office, solutions can be difficult. Papers, files and clutter are an unsightly mess on a desk in your living space. 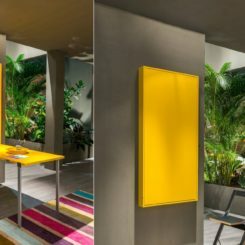 This desk converts to a cabinet in an instant, concealing your work in progress, The desk is equipped with LED lighting and wire management to keep the space functional and tidy. 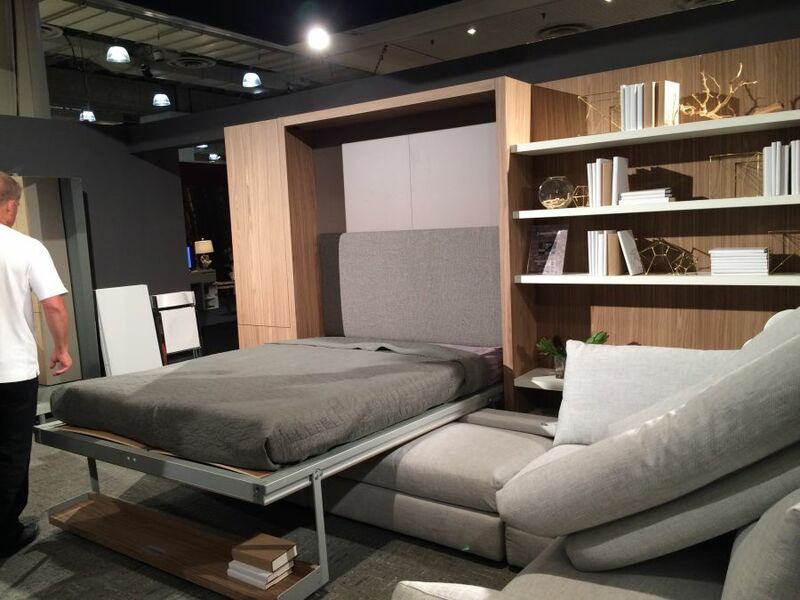 Resource Furniture says it pairs well with their bed and shelving systems as well. 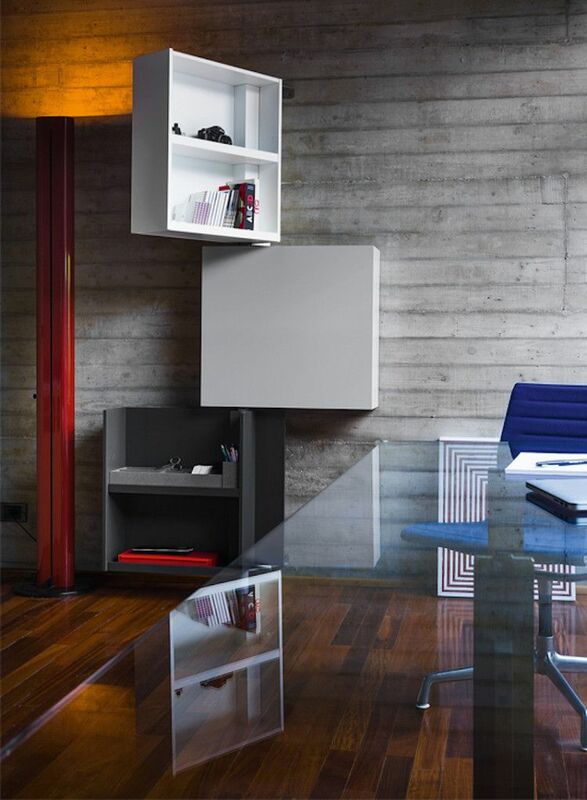 This LGM Tavolo Unit is a desk, bed, shelving all in one. 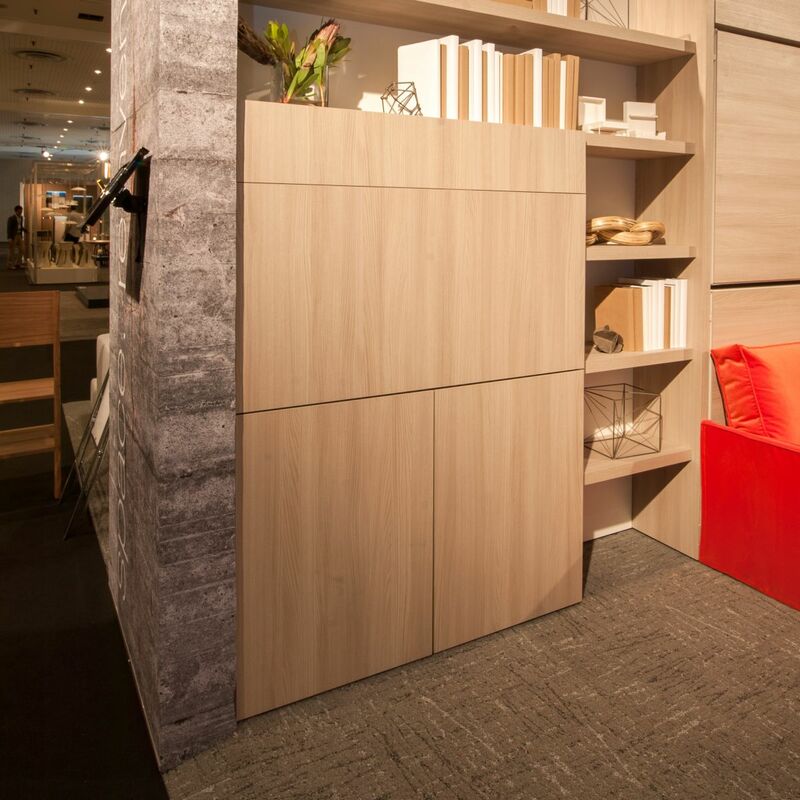 The queen size wall bed includes 35 linear feet of shelving and a 5 foot fold-down table. The shelving spins to reveal the bed with side tables. Multifunctional is an understatement. Such a modern and clean design for a hardworking unit! Maybe you don’t need or want a full wall system and you just need to squeeze some extra sleeping space out of your space. The Palazzo is for you. 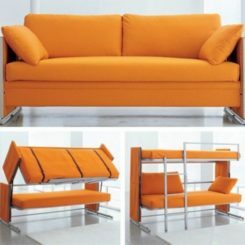 It transforms from a regular sofa into a set of bunk beds for children or adults. They have safety barriers and a ladder. 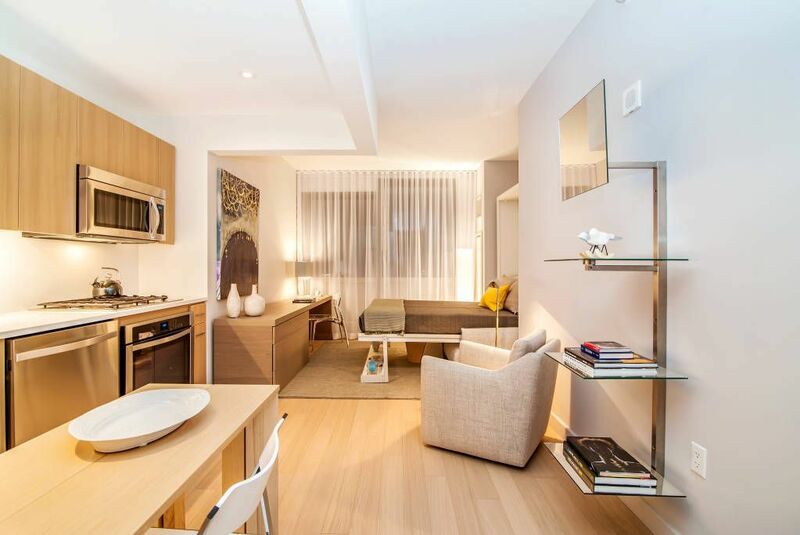 A special project in Harlem renovated a number of micro units using Clei wall beds and storage systems. 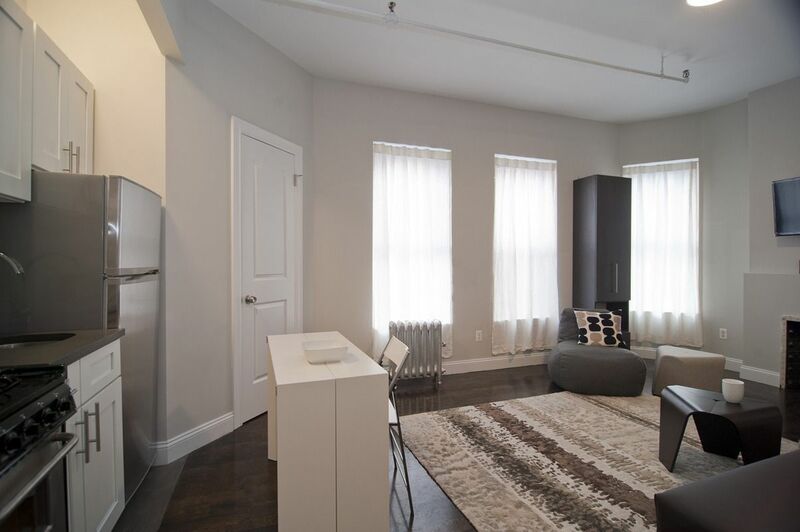 The units — from 155 square feet to 230 square feet — are truly multi-functional and designed to make the most of every square foot. These designs make you realize how well you can live in a small space when it’s well-designed. 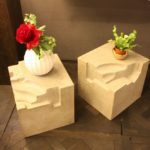 In addition to wall systems with beds and storage, Resource Furniture offers a variety of coffee tables with a leverage mechanism that allows them to double as desks or dining tables. 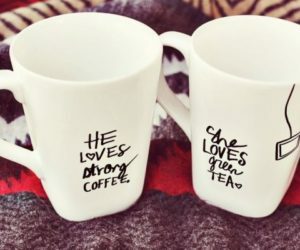 How awesome is it to eliminate the need for a separate. big dining table for those occasions when you have guests. This sleek piece is the Mondial. It is a coffee table that lifts to the proper height for a dining table with a folding top. 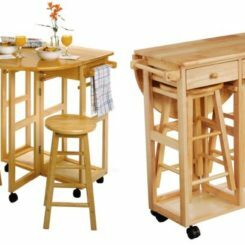 It’s truly a multipurpose piece — on wheels — and can be used as a desk as well. 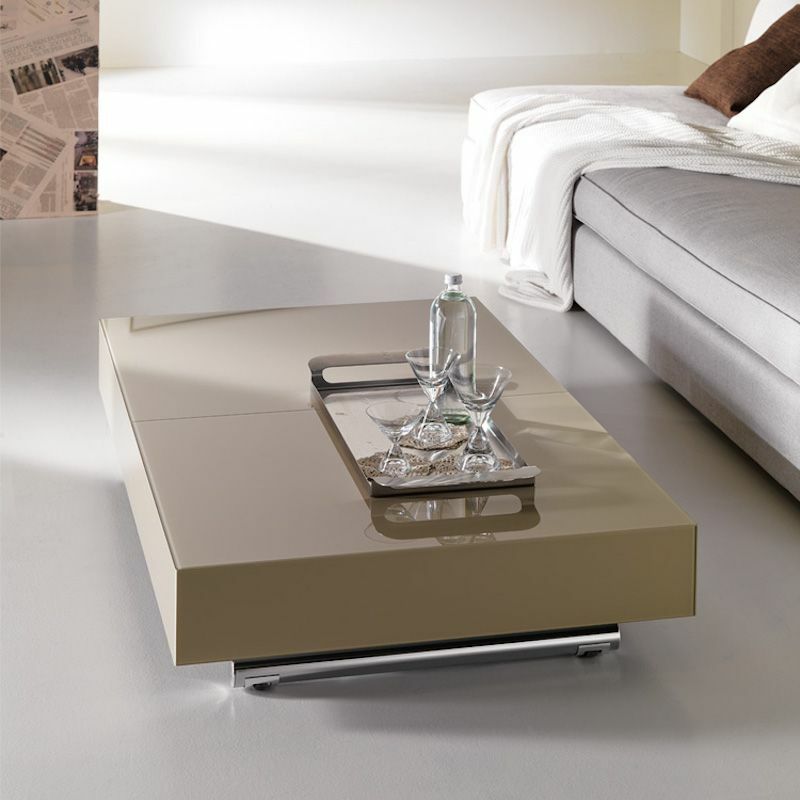 Ye another transforming coffee table is The Cristallo. 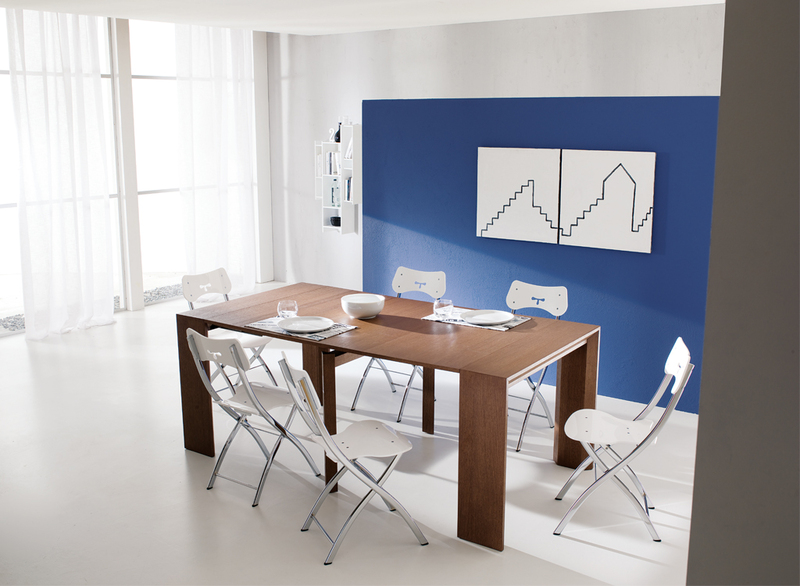 Its metal frame rises to a new functional level as a dining table. 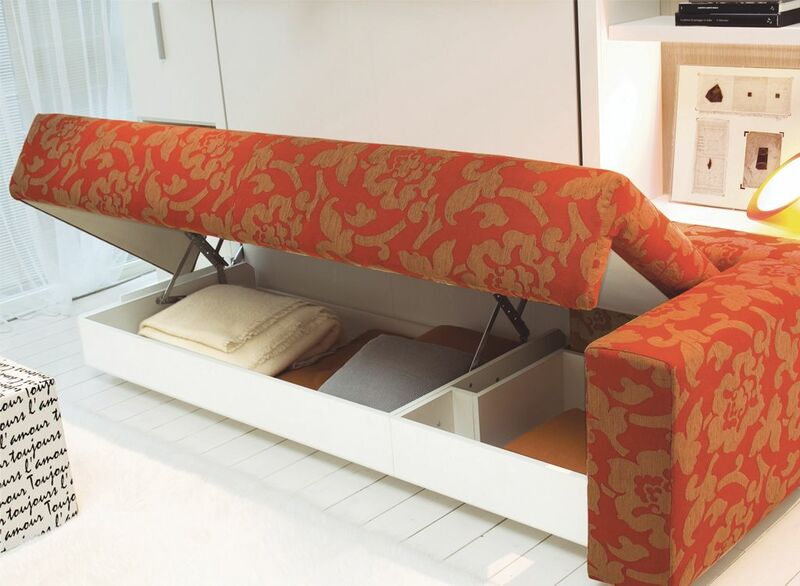 The adjustable piece has two self-storing leaves, making it easy to accommodate lots of last-minute guests. 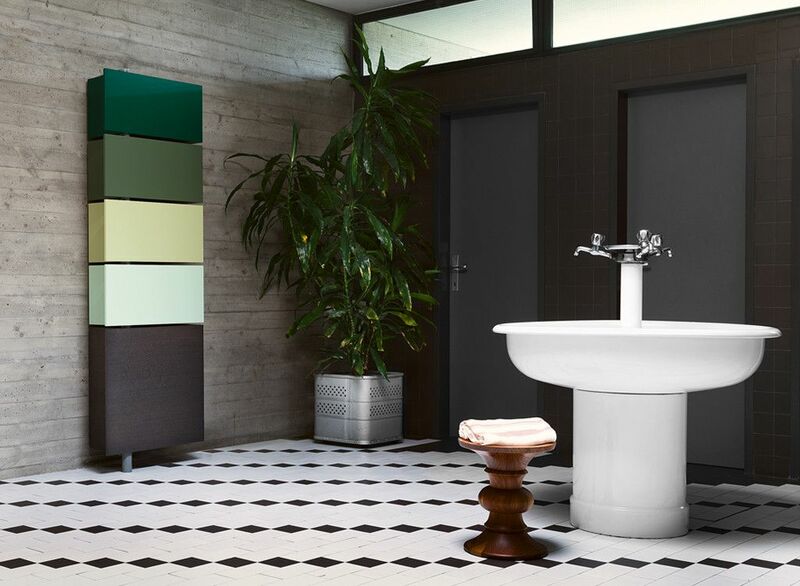 The Cristallo is available in glass, wood, slate and reclaimed pine finishes. 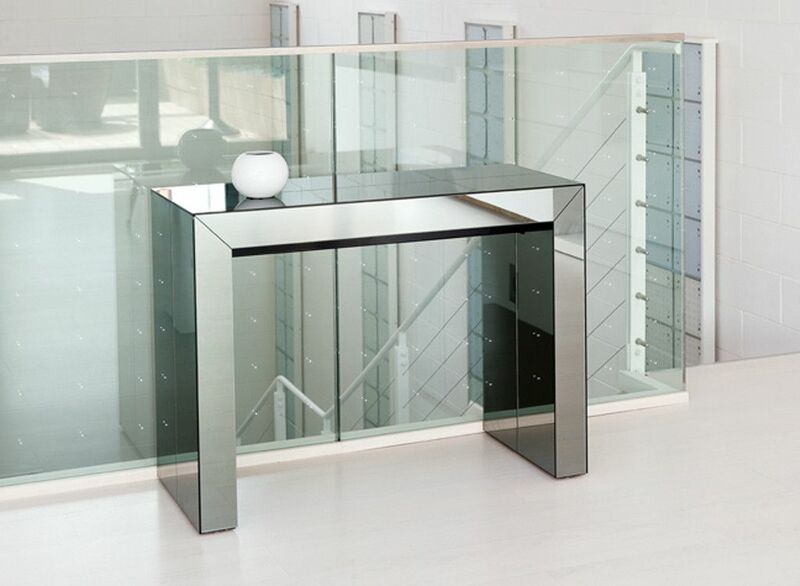 We love the sleek top and metal base. Yet another versatile design, the Magic is a quickly convertible piece. A few extra people for dinner? 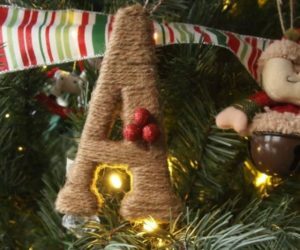 A large project you need to spread out? No problem! 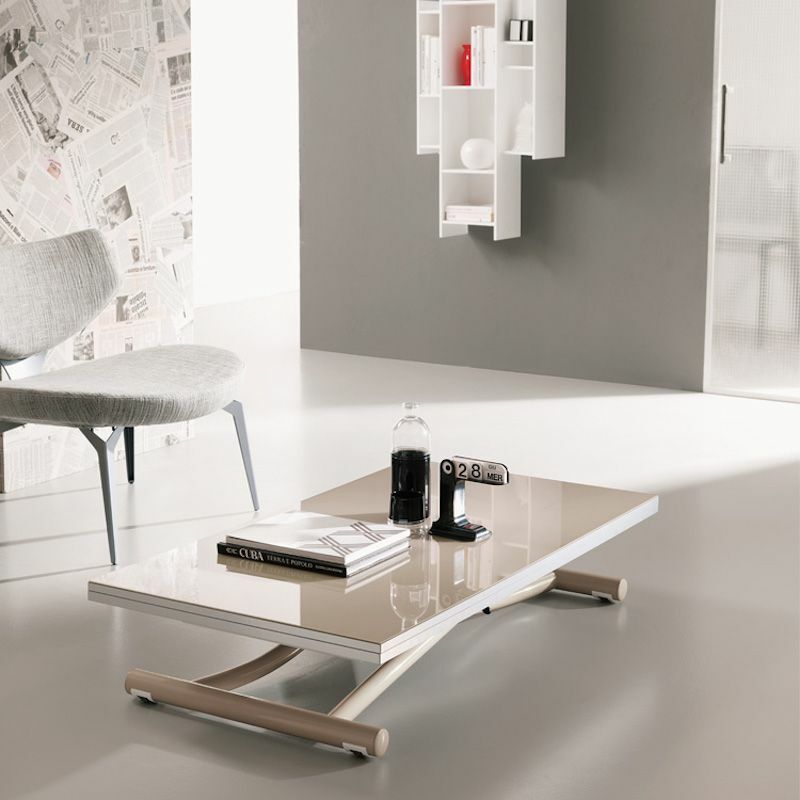 The sleek, modern coffee table rises to the occasion with little effort. 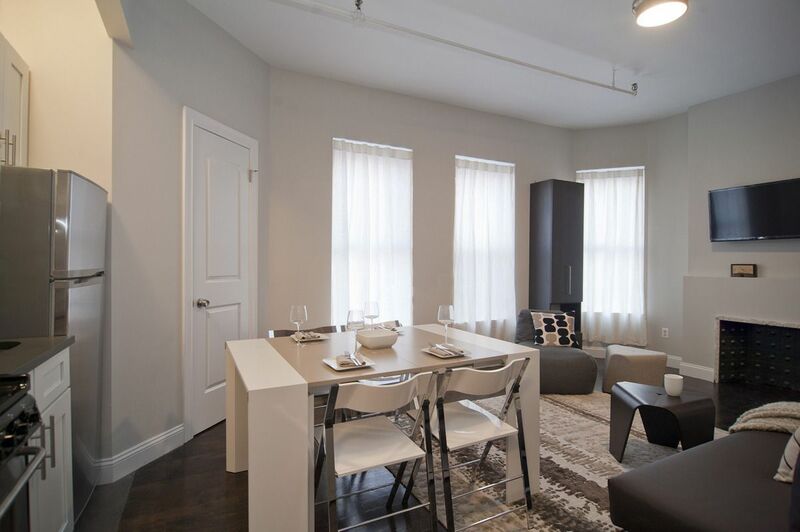 It’s hard to believe this modest console can expand to a dining table that accommodates a dinner party of 10 people! 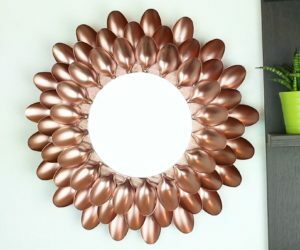 The Goliath Glass has a special aluminum telescoping mechanism and five leaves that extend from a mere 17 inches to 115 inches! 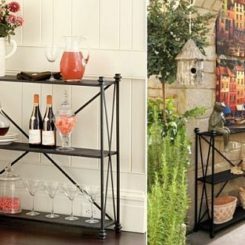 We don’t think that you need to live in a small space to want this versatile piece. 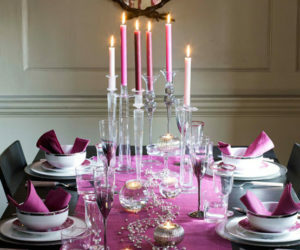 It would make holiday entertaining a breeze without a lot of fuss. Giralot is a storage system that saves serious space and conceals whatever you need to stash away. 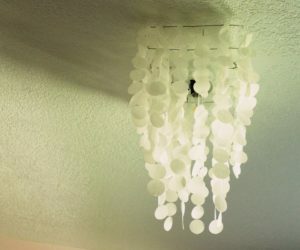 It can be used in any room. 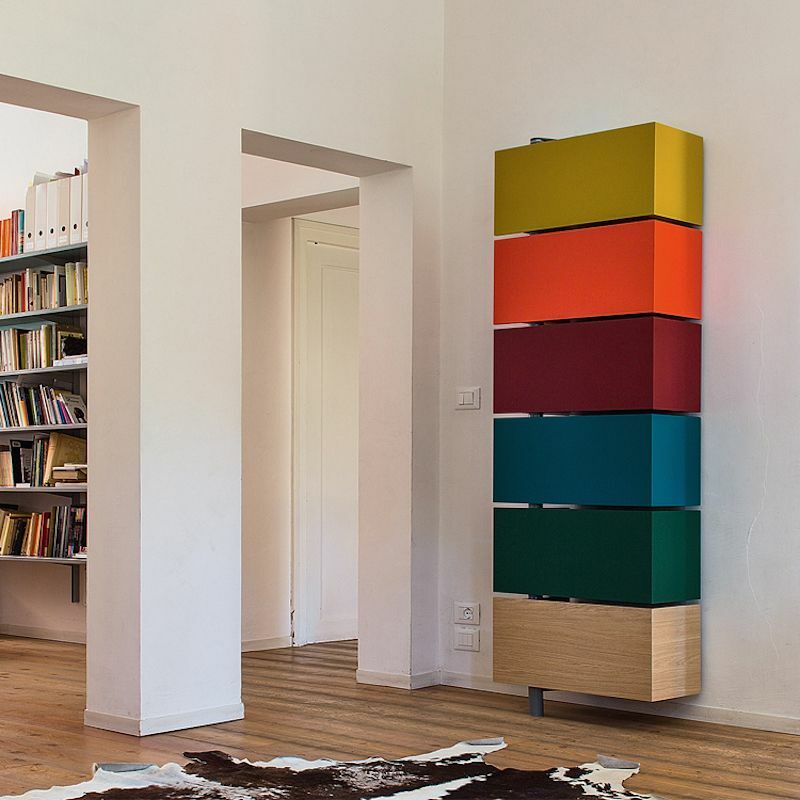 As much a design element as a storage unit, it swivels 180 degrees on a column that rests on the floor and is attached to the wall. It can be built to open to the left or right for increased versatility. 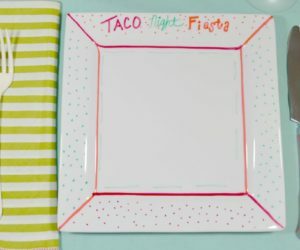 Plus, you can go neutral or make a colorful design statement. Book-lovers know that their collections can take up a lot of interior real estate. 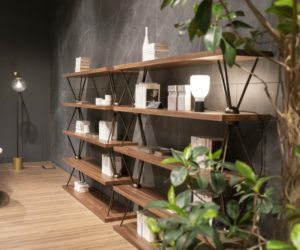 The Cleopatra book shelf is an artful vertical storage unit that will allow you to house and display many volumes without taking up precious wall space. 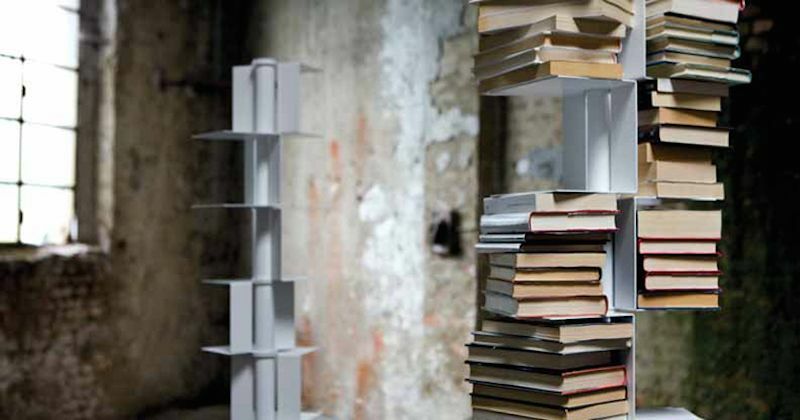 The design also allows you to display objects along with your favorite books. Even seating has been re-configured to maximize utility and minimize storage space. 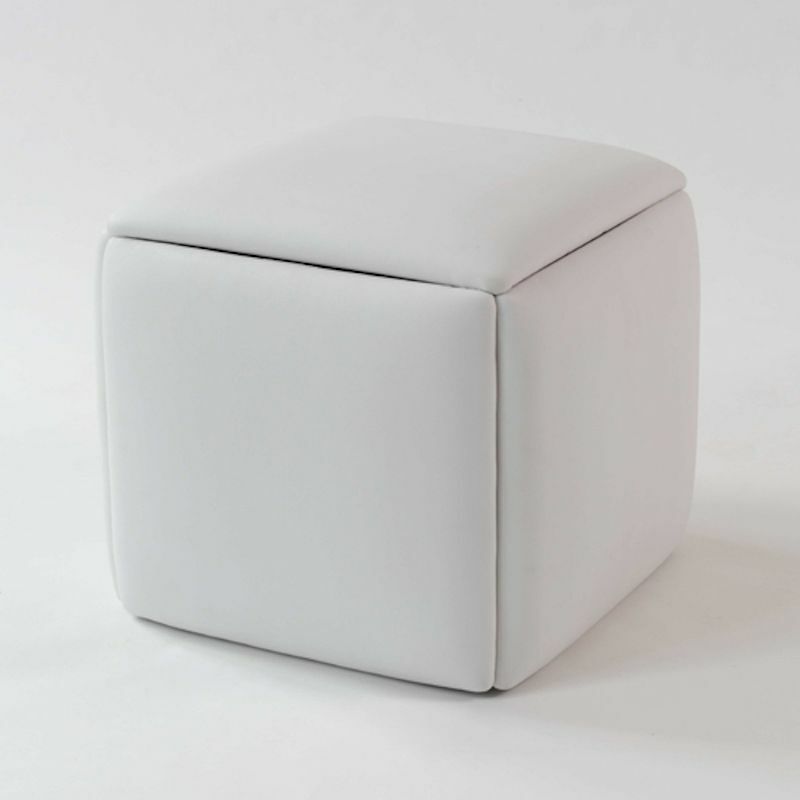 The versatile Cubista Ottoman holds the bases for five stools. The padded top and sides quickly convert to seat tops. A set of these ottomans could take the worry out of entertaining friends and family by providing extra seating without the need to store extra chairs. Even folding chairs have been redesigned to fold completely flat and take up a minimum or storage space when not needed. 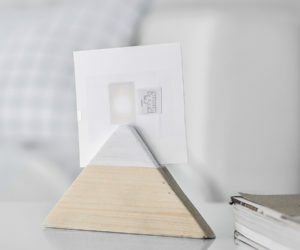 The slimmed down model is less than an inch thick when closed and is very unobtrusive to store: Stack them in a closet, slide them under a bed, or put them on a shelf. 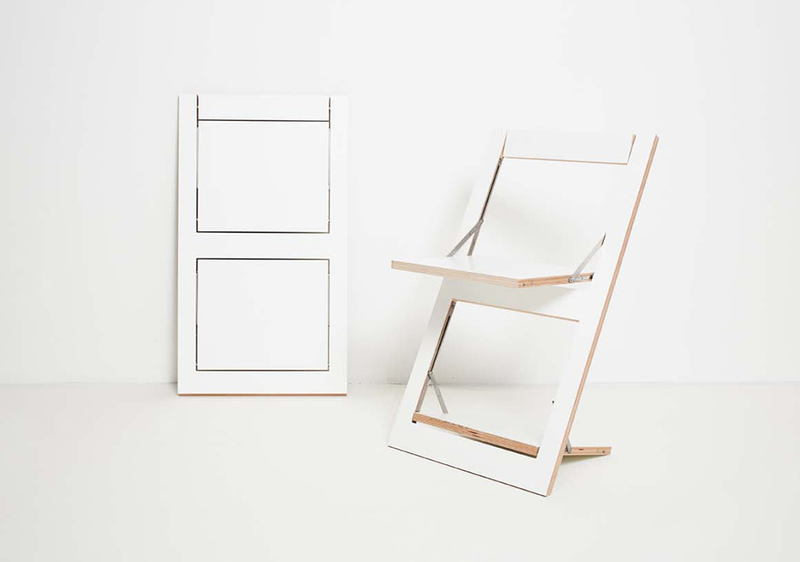 The unique folding mechanism isn’t visible when the chair is flat, so you don’t feel like you really need to hide these either. 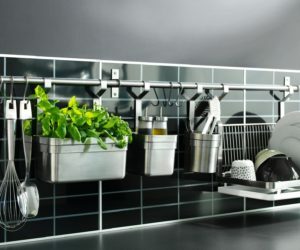 Like with most designs, your needs, budget and imagination are the only limits for what space saving design can do. 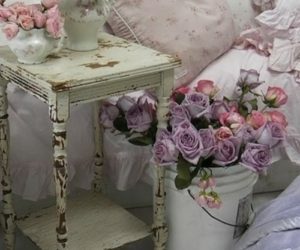 That little-used guest room can also be your office or hobby room. 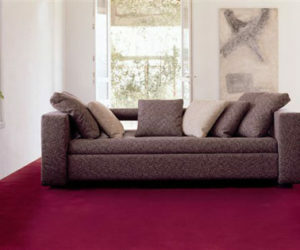 Your family room can house a number of visitors in style and comfort in matter of seconds. 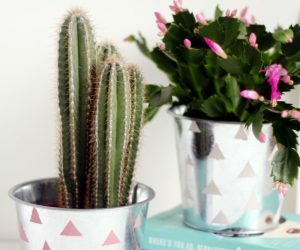 No matter what your living space is like — small and urban or large and suburban — space saving designs like these can help you squeeze more use out of the space that you have.